"Love unhomogenised milk. LOVE. Come to mamma, you gorgeous little bits of cream." That was my tweet over the weekend. Oh, good old-fashioned milk with light and lovely clouds of cream. What's not to love? I don't buy milk very often, so when I decided to get some recently, I chose to treat myself at my local providore with a bottle of full-fat, bio-dynamic and unhomogenised milk. 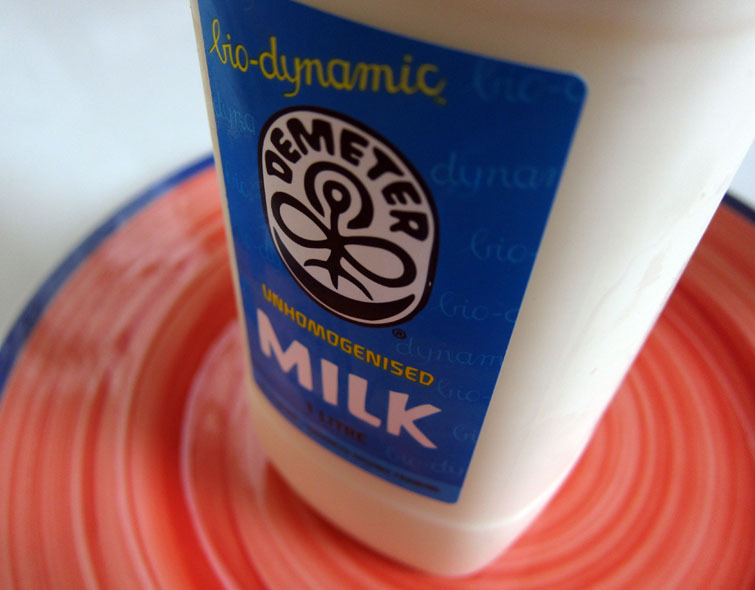 a bottle of biodynamic and unhomogenised milk. Sadly, it appears that not everyone shares my sentiment... unhomogenised milk is the exception rather than the norm these days. Quick summary: milk, left in its natural state (i.e. 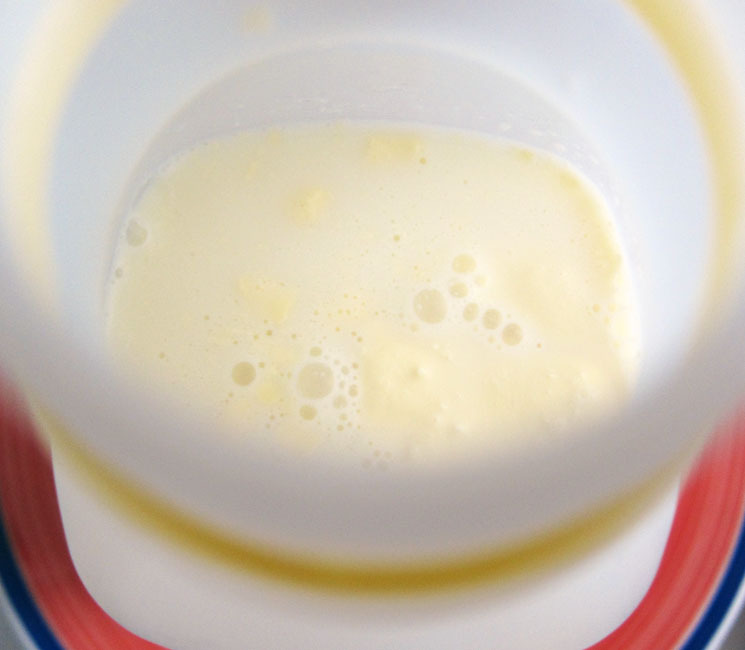 unhomogenised), eventually settles down so that the cream separates, floating to the top. Evidently this is unappealing to some - and thus homogenised milk was created. Fat globules are broken up with high pressure methods, enabling them to suspend evenly throughout the liquid, forming an emulsion. I spent a large part of my life drinking homogenised milk, but the first time I tried unhomogenised milk, some years ago, I instantly fell in love. It was fuller... it was richer. It was even a little sweeter and nuttier. It tasted like... well, it tasted like what real milk was meant to be, and what it should be. I can see how unhomogenised milk might be a bit of a culture shock for those who grew up drinking homogenised milk. It doesn't look clean and white and perfect. It's a gentle pale yellow with creamy clumps and clusters. When I opened up my bottle of milk, there was a large fatty puff sailing serenely on the surface. I had to shake the bottle vigorously to break it up, and even so, there were still stubborn little chunks remaining. Personally, I think those little chunks of cream are awesome; I love the way they melt in my mouth. After all, cream is fantastic stuff, so why wouldn't I want random bits of cream in my milk? Yeah, I'm all for it. Nom nom nom. Now, when all is said and done, it's really an individual preference. However, if you've yet to try unhomogenised milk and it sounds like your thing, I highly recommend going for a full-fat version that is either bio-dynamic or organic, just to get the most out of it. Yum! I love milk in all forms - especially truest to its most natural self. It's rare to find the awesomeness that is unhomogenized milk... did you find it in the neighborhood? Yay for milk love! Yas, off the top of my head, you should be able to find unhomogenised milk at The Vegetable Connection in Fitzroy, Grove & Vine in South Yarra, and Prahran Market (I think Ripe Organics, and maybe some of the other stalls as well). Ooh Fatbooo, raw as in unpasteurised? I'd love to try that too! I think I might've seen it once somewhere, must hunt it down again. In older British cookbooks they suggest serving desserts with cream or "top of the milk". I miss "top of the milk". You can buy it pretty easily here, but as I don't often buy full-fat milk I don't bother. 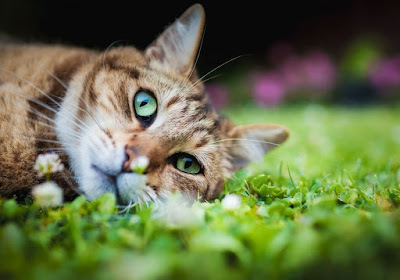 I like that, Foodycat! What a lovely glimpse of how it used to be. And the "top of the milk" would indeed go beautifully with desserts! I have never come across unhomogenised milk; I bet it would make wonderful cheese! I hadn't thought of that, Gerlinde - it probably does! I don't think I have tried that? I have tried whole milk with (milk solids) cream top though - and milk with cream definitely do taste different. That sounds like unhomogenised milk to me, tigerfish! We used to get unhomogenised milk delivered in bottles, and if we weren't quick enough in the mornings the magpies would peck through the thin alfoil lids and drink the cream! When I worked at an outdoor cafe the magpies would steal cream and drink leftover milkshakes on the tables as well, I guess they know a good thing when they see it! I've heard this milk is much better for you as when milk is homogenised the fat globules break into pieces that are too small and can't be processed properly by our bodies. Those magpies are smart, aren't they Intolerant Chef! I've heard about the milk controversy too, it seems inconclusive to me. However unhomogenised milk certainly feels and tastes more nourishing to me so either way that's what I prefer to go for if I'm not skimping. You should try Schulz Organic Milk - unhomogenised as well. They also do a fantastic organic yoghurt. I would have gone full fat anyway! Hahahah... Love me fat fat full cream milk! Thanks for the suggestion, Dave! I'll keep an eye out for Schulz.